Usually I'm one of the people grouching about how xmas stuff shows up in stores earlier and earlier...unless it's polish. When I found Orly's Infamous collection at a local nail supply a few weeks ago, I wasn't going to gripe. Sally Beauty and other stores probably won't have these until late next month or early November, but here's an early look at the two I bought. 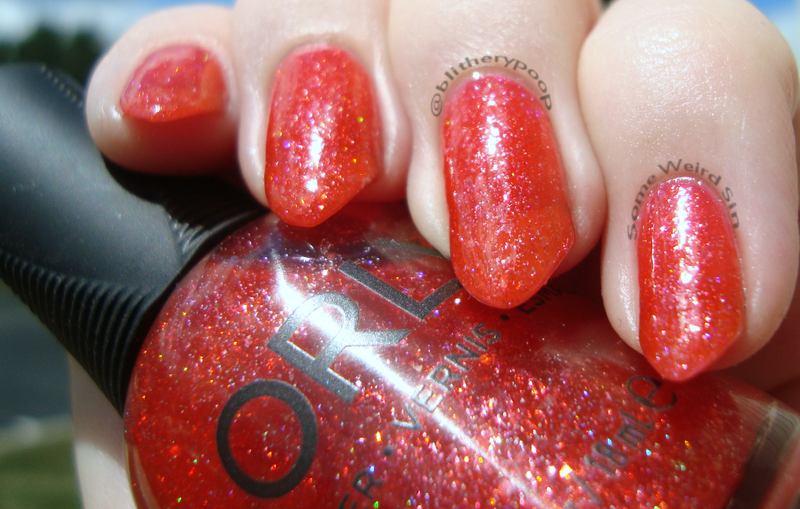 15 Minutes Of Fame is a coral pink jelly with iridescent flakes and holo microglitter. So squishy! Coulda sworn it was redder in the store though. It's much pinker than I'd expected, with a coral-y, orangey thing going on. The orangeness varies with the light. The holo glitter is more obvious in person than in photos. It flashes different colors as you wiggle your fingers. The formula is decent, and this is three coats. 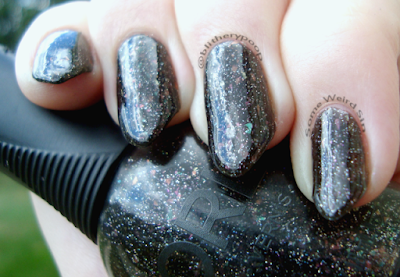 Frenemy is a dark gray jelly with holo microglitter and iridescent flakes. The flakes are waaay more visible in Frenemy than they are in 15 Minutes Of Fame. They're the same kind as in the Matte FX toppers from a while ago. They're suble, but pretty. 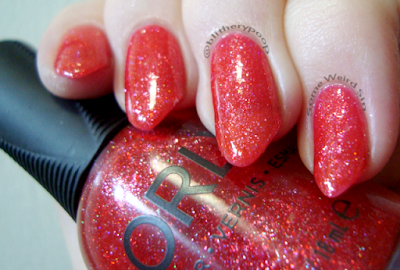 The holo glitter is more obvious too, since red/pink always seems to tone holo down. It looks deeper too, somehow. Can you tell I like it way more? I mean...it's almost black AND it's not pink. It's also a three-coater for depth and coverage. The flakes tend to poke out on the edges and make cleanup a little tricky. It's more noticeable with the blackish base than with 15 Minutes' pink base. Bottom line: Both shades have jelly bases and the same flakie and microglitter mix, but the effect is much more noticeable in Frenemy's almost-black base. Decent formulas and tons of depth and twinkle. 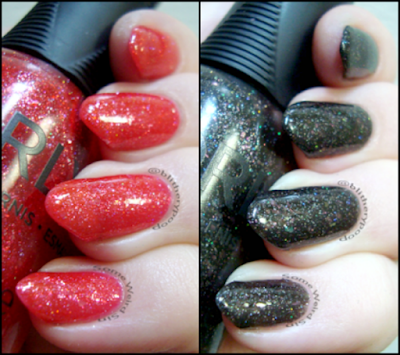 Have you spotted any new holiday polishes yet?